This sweet and gentle boy is the quintessential picture of serenity in a room he shares with a bunch of younger, more exuberant cats. When Gizmo was first introduced to this room, he seemed a bit overwhelmed by his unfamiliar roommates and his new surroundings. During those first few weeks, he could always be found sleeping under the cat tree in the corner with his back to the wall. I'm guessing this was to make sure that the other cats -- and people -- couldn't sneak up behind him. During Gizmo's "wallflower" stage, Tracey and I had to lay on the floor and weave our arms through the bottom levels of the cat tree just to pet him. While he loved the attention, it wasn't enough to get him to move from the security of "his" corner. You can imagine our delight in recent weeks when he began venturing from his safe spot. He now walks through -- and sometimes sits in -- the middle of the room! As you can see from these pictures, he's gaining in confidence with each passing day. Throughout this transformation, Gizmo's sweet nature has remained constant. I believe with all of my heart that he'll continue to grow, especially once he has the consistency that comes with having his own people to love and his own "forever" home. To see another, more candid photo of Gizmo, click here. Hooray! We just found out that Tump has been adopted. Enjoy your new forever home, buddy. We love you! When Ginger and her buddy Tump first came to PAWS, it broke our hearts to learn that they ended up with us because their owner passed away. I would imagine that going from a home where they were well-loved and free to wander around to being confined in cages (nice cages, mind you, but cages nonetheless) would be a traumatic experience for these kitties. Surprisingly, though, both Tump (the handsome grey fellow) and Ginger (the gal "done up" in orange) have handled the transition with great aplomb. Both are extremely calm and affectionate, and seem to get along well with other kitties. And both seem bent on proving people who believe that all cats are aloof are just plain wrong. Aloof? Ha! Both Tump and Ginger come when you call them, and neither has ever met a lap they didn't like. As much as they love bonding with us volunteers, Tump and Ginger don't seem too dependent upon each other, so they don't have to be adopted as a pair. Every once in a while a cat will come to PAWS that seems to fade into the background amongst the many kitties that reside there. I feel that Minnie is one of those cats. When I approach her cage, I see her sitting in the cat bed, somewhat melancholy. But she's quick to come to the front of the cage when you stand in front of her and say some words in a relaxed tone. Her demeanor is one of a shy cat that has difficulty trusting people. Could it be that because she was de-clawed she lost the ability to trust unconditionally? What Kevin and I have learned is that if we approach her in a slow and quiet way, she responds very well. Minnie needs a gentle and patient soul to give her a quiet home, and in that type of environment, I'm 100% sure she will flourish. "Oh hi! What are you guys doing?" Check future posts for more on roommates Gizmo (bottom) and Dora (top/upside down)! It took Houdini less than 24 hours to unveil his next trick. I sat down in a chair in the room today, and was delighted when the little guy jumped onto my lap for a session of petting. I guess we shouldn't be surprised anymore by anything Houdini does. In any case, it's extremely fun and rewarding to watch him grow each week. 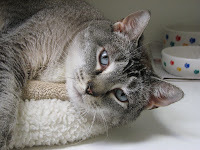 Our sweet Chyna is a beautiful, blue-eyed, gray tabby female who is 8 1/2 years old and a total lap cat. Her former owners brought her to PAWS because their dogs constantly were herding Chyna. While she seems to have acclimated pretty well to shelter life, you can tell Chyna is very curious about the world that is outside her room. Chyna would be a very positive addition to anyone's home. Pepper ... A Spicy Girl! This cute, chubby girl came to PAWS not too long ago, when her owner could no longer care for her. A "young" 15 year-old, Pepper meows at us for attention and enjoys a good petting. While Kevin and I have attempted to take her out of her cage on a number of occasions, she's not taking the bait...We suspect she may be a little cage-dependent. 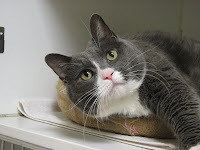 When she first came to PAWS, Madeline was what you might call a "scaredy cat." We can't say we blame her, though. After all, this poor little girl was abandoned outside in a cat carrier on a frigid winter day ... what a terrifying experience that must have been. Madeline lives in one of the "open" cat rooms at PAWS, and her affinity for other kitties has been evident from day one. But when it came to people, she'd try to hide or -- at best -- stay just beyond arm's length of the volunteers. Oh, how times have changed! Miss Madeline has learned she can trust people, too (and that people are sources of good things like food, toys and pets!). As a result, this little sweetie has become one of her room's most outgoing citizens. Today, for instance -- after some petting and much purring -- she jumped up onto my shoulder and calmly took a ride around the room. She was happy as a clam (and so was I)!